Images and videos of a mobile phone rumored to be the Treo 670 have leaked onto the web via HowardForums. The Treo 670 is shown running Windows Mobile 5.0, which is a big deal since Palm has never shipped a Windows Mobile device. 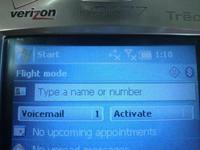 The Treo 670 has a large Verizon Wireless logo on it, but past Treo models have been made available across all most carriers. Purported features of the Treo 670 include: * EV-DO high-speed data * Bluetooth * 1.3 megapixel camera Two video files of the unit are available [1, 2].